There’s a growing alignment gap between business demand for flexible services and IT’s ability to deliver; while IT budget and resources are constrained, the hyper-connected enterprise is demanding more mobile, cloud and collaborative services. Now offered by incumbent and alternative service providers, SIP trunks provide enterprises with access to a wide variety of cloud-based communications services ranging from basic telephony to rich unified communications (UC), HD audio and video conferencing, contact center services and complete business process outsourcing. They are much more than a low-cost alternative to primary rate interface (PRI) trunks for PSTN access. SIP trunks can help increase business agility, improve productivity and enable the hyper-connected enterprise—organizations that use communications to achieve new levels of customer engagement, employee productivity and competitive advantage. 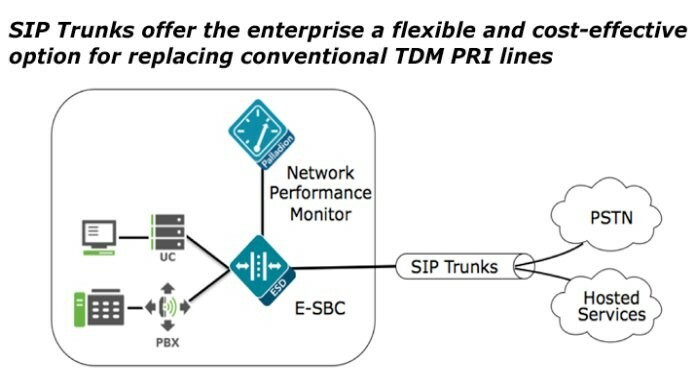 Economics—Businesses typically oversubscribe to legacy TDM trunks due to their inflexible nature, but SIP trunking allows organizations to “right size” their trunking requirements. SIP trunks are available in more granular increments than PRI circuits and they can be easily adjusted to meet changing business conditions. According to Forrester Consulting, enterprises can see a 40-60% reduction in monthly service fees by replacing costly, underutilized T1/E1 TDM line services with lower-cost and more efficient SIP trunks. The enterprise can also reduce the need for IP-PBX hardware. By consolidating trunks, SIP helps reduce the number of trunk gateways and line cards in the network. Companies can also reduce the cost of usage fees because SIP trunks help save on expensive audio conferencing fees and toll service charges. For more information on the economics of SIP trunking, download the Forrester Consulting report The Economic Value of Enterprise Session Border Controllers. Business Agility—SIP trunking allows the enterprise to increase business agility and improve customer experiences by offering new communication channels like video and online chat for customer engagement. Organizations can also increase workforce productivity by enabling bring your own device (BYOD) policies and easily supporting “work from anywhere” initiatives, and can better comply with regulatory demands by recording interactions based on policies and maintaining an accounting trail of all interactive sessions. Hosted Services—When deploying hosted IP communications services, businesses must ensure their IP telephony and UC solutions interoperate seamlessly with the hosted service provider infrastructure, confidential communications remain safe and secure and end-users enjoy outstanding service quality. Hosted services provide a migration path to the cloud, and SIP trunks help move communication services into the cloud for easy access. SIP trunks enable hosted services that accelerate collaboration, such as cloud-based audio and video collaboration solutions. Companies can efficiently deploy hosted offerings based on business offerings, such as Microsoft Office 365. Hosted services also allow organizations to leverage workforce mobility and provide UC services to remote workers and remote agents. For more information, download the Hosted IP Communications Services Solutions Brief and read this case study of a large enterprise software company that deployed cloud-based services and reduced costs using SIP trunks. For additional information on why businesses are turning to SIP trunking, download the SIP Trunking Solution Brief and for a better understanding of the ROI of SIP trunking, read the Forrester report The Economic Value of Enterprise Session Border Controllers. This blog is the first in a series of three. The next blog will discuss the three major challenges that enterprises must address when deploying SIP trunking, and the third blog in this series will provide a brief overview of SIP trunking solutions followed by summaries of the applications and benefits of three recent SIP trunking deployments. Previous articleWhere is my Telco Cloud?